My family is definitely ready for fall. Bring on the football games, the fair, and everything pumpkin spice. 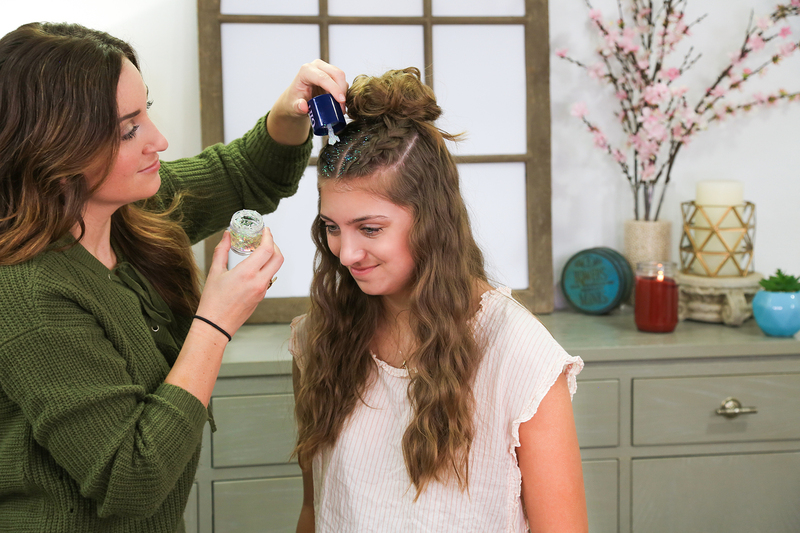 With Halloween just around the corner, I love anything that adds a little pop or pizzazz to the hair. I decided to test Glitter Roots on a cute half-up hairstyle that would showcase the partline. So, today I’m going to show you a Fab or Fail and hairstyle all in one. You can buy Glitter Roots online. It comes with the product, an application brush and a travel kit for touch ups. Glitter Roots comes in 3 colors: Mermaid Sparkle, Unicorn Queen, and Rainbow Party. We decided to use Rainbow Party for this tutorial. Start by parting the hair down the center. At the top of the head, section the hair into 2 even sections. Dutch braid the first section. 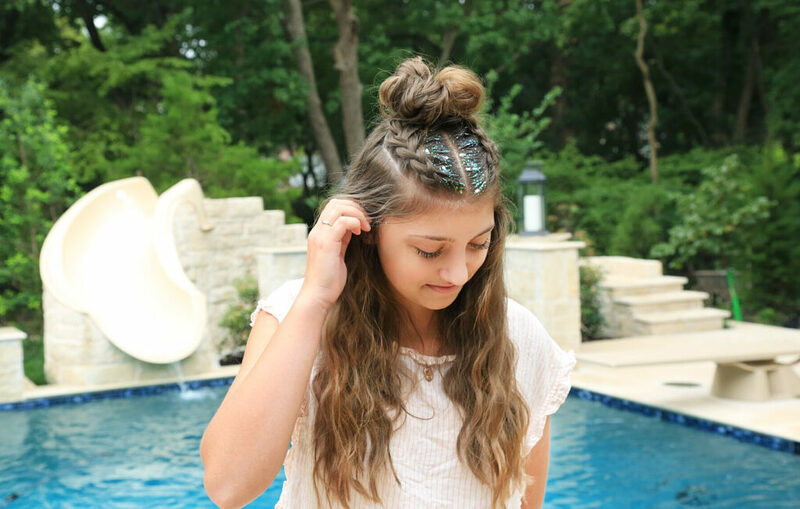 Once you get to the end, continue braiding the hair into a normal 3 strand braid. TIP: To add more volume backcomb the hair. Gently pull apart and pancake the braid to make it look full. Repeat steps 3 and 4 on the other section. With the remaining hair, make a messy bun with a small elastic. Use bobby pins to secure. Brush the glitter onto the roots. TIP: Begin with a small amount of the product and build. I would definitely give Glitter Roots a FAB! Fab because the product is super easy to use and the results were AMAZING! I really think this a great product for any age that you can wear to any even from spirit days to dance competitions. I do wish the application brush was just a little bit longer. However, the product was still great. Plus the product washes out pretty easily. I tried this on Rylan the night before, and the product washed right out. I love that the price is affordable and each color comes with a travel size kit that you can throw in your backpack or purse for touch-ups on the go!